Holiday meals always bring to mind mouth-watering roasts. 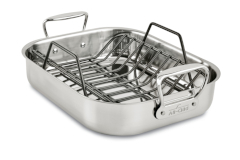 If your tradition is a golden brown turkey, a Tofurkey, a Turduckin or ham or goose, we'll help you find the right roasting pan. 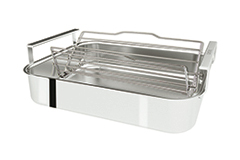 Check out several sizes of All-Clad roasters in stainless steel or hard anodized. 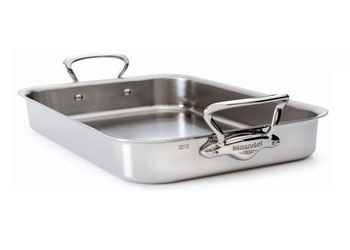 Or, choose a stainless steel turkey roaster made in France by Mauviel cookware. 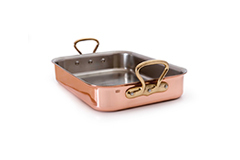 Mauviel also makes copper roasters in several depths so you can select the size to best cook the main attraction of your holiday dinner. 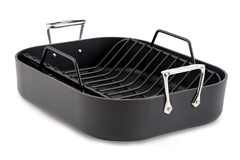 FREE SHIPPING in the continental U.S. on cookware sets, roasters, and most cookware items too!